The theme is Touched By Mercy, Moved by Love! Please join us in prayer for the success of the conference! He is the Gospel, the living Testimony to your Love and Mercy. And to serve those who are in need of healing. 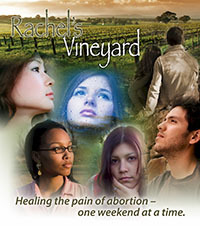 Who have come to you for healing after abortion. That they can find forgiveness, peace, and healing. For the international conference this month. With others who are involved in this ministry. And all the power of death absorbed by the everlasting victory of Life! We ask this in the Name of Jesus, the Lord. AMEN.